I know a whole lot of people who really can’t stand Valentine’s Day. In fact, it often seems like more people dread it than look forward to it. Valentine’s Day gets a bad reputation. People don’t like a lot of things about it. They say it’s cheesy. They say it’s just an attempt by greeting card companies to make more money. They say it creates awkward, forced, cliché, stressful and/or inauthentic “romantic” experiences that are anything but. Some of those who are single say it highlights the fact that they aren’t in a romantic relationship, rubbing salt in an already painful wound. I get it. I really do. Especially that last argument. Love, or the lack thereof, is painful. Love is also really scary. So what do we do? 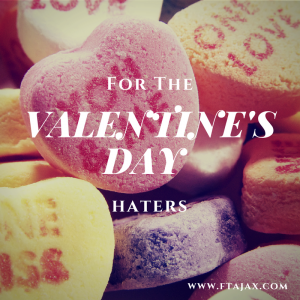 We make ourselves feel better by acting like we’re too cool for Valentine’s Day. Well maybe not sad, but disappointed. Maybe that’s to be expected of a couple’s therapist, but regardless, I can’t help but feel the need to advocate for Valentine’s Day. After all, love is pretty darn important. Why shouldn’t we celebrate it? It doesn’t have to be expressed in the forced, cliché, ways it’s most commonly known for. You don’t have to spend a gazillion dollars on overpriced roses, buy heart-shaped boxes of disgusting assorted chocolates, and make reservations at an expensive restaurant three months in advance in order to do Valentine’s Day “right.” And you don’t even have to be in a romantic relationship. I want to challenge you to use Valentine’s Day as an opportunity to practice gratitude for the relationships in your life, romantic and otherwise. Maybe you decide to follow in the footsteps of Leslie Knope of NBC’s Parks and Recreation, and celebrate Galentine’s Day instead (you can watch her describe it for herself here). Maybe you choose to forego the expensive flowers and fancy dinner, and instead cook together at home. You could designate the night as a “screen-free evening” and take a walk outside, holding hands and talking, or blowing the dust off your old, neglected board games. You could set aside time to write an actual, old-school letter to a long-distance friend. And if it’s really too painful to go there – you’ve been wounded and feel too scared to pursue relationship, romantic or otherwise – I encourage you that you don’t have to live that way forever. Isolation and loneliness doesn’t have to be your fate. Maybe it’s time to think about doing the work to heal those wounds and start the process of cultivating healthy, safe, enriching relationships. We are here to help you on the journey, should you muster up the courage to take those first scary steps.